Billy Fury's younger brother, Albie Wycherley, who died on 5 September 2011, also had a notable career in the music business. In recent years, he developed a highly-praised repertoire of Billy Fury material, which could divert attention from his own very considerable abilities with new material, such as his excellent EP, I Never Met Collette. Albie, who kept his home in Liverpool, had been in poor health for several years.. He was born on 26 June 1943. In the mid-60s, Albie adopted the stage name Al Trent and fronted a group called The Centremen, composed of John Kirk (lead guitar), Terry Barrett (rhythm guitar), Charlie Richmond (bass guitar) and Billy Conroy (drums). 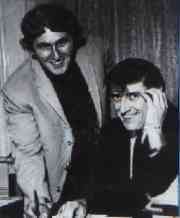 At the age of 22 in 1965, he signed with Joe Meek (pictured left). Joe changed his stage name to Jason (because he thought that Albie looked Greek) Eddie (from Albie's middle name, Edward). Their first record, Whatcha Gonna Do Baby, backed by Come On, was released on Parlophone in December, 1965. During early 1966, they made the follow-up, Singing The Blues, backed by True To You, which was also released on Parlophone and reached the top 30. 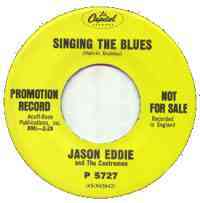 Albie made a final single as Jason Eddie, Heart And Soul, which was released on Tangerine in 1969. The early tracks have subsequently been released on the CD Billy Fury Sings A Buddy Holly Song (Ozit CD56). Albie produced a superb four-track CD, I Never Met Colette, of which the title song is a tribute to Billy. To hear the title track, click here. The CD is available from our sponsors, Peaksoft. 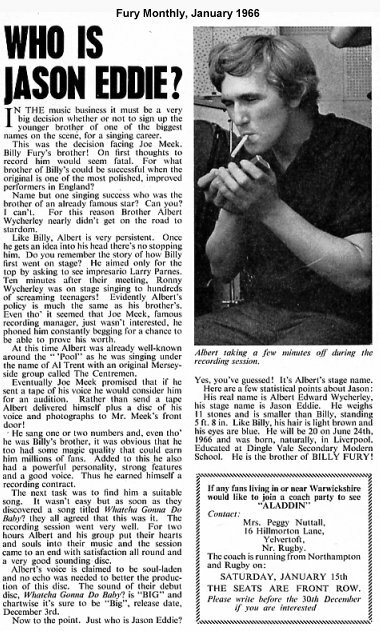 For a report of Albie's appearance at the tribute weekend in Blackpool in November 2000, click here. 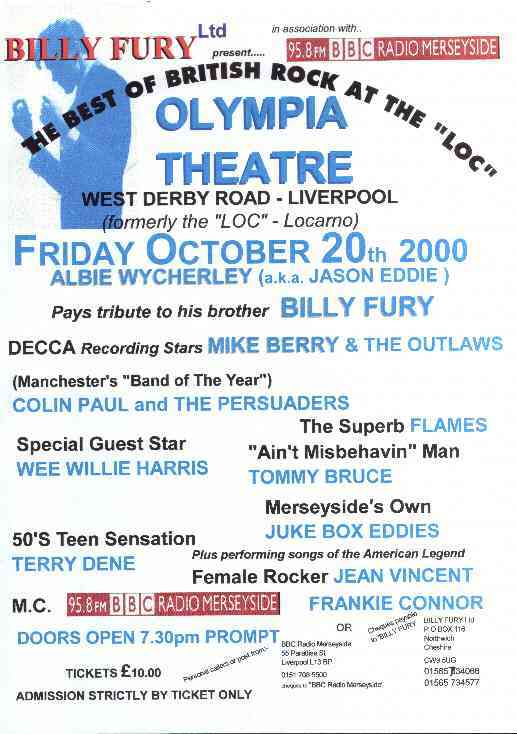 Albie appeared at the Olympia Theatre, Liverpool, on October 20, 2000 supported by Mike Berry and the Outlaws, Colin Paul and the Persuaders, Tommy Bruce, Terry Dene, Wee Willie Harris, and more great acts. For a copy of the poster, click here. He also appeared at Worcester Park Club, Malden Terrace, Worcester Park, Surrey, on August 4, 2000. For Ann Clark's pictures and review of the show, click here. He headlined a concert after the unveiling of the Billy Fury statue in Liverpool in April 2003. Read about it here. Away from the stage, he worked at various times as a butcher and a car salesman, He leaves a son and two grandchildren. He had been in poor health for several years. His wife Marie died in 1997, and his only son lives abroad with his two grandsons. There was a large turnout to say farewell to Albie, who arrived at the church in a horse drawn glass carriage on a beautiful sunny day. There was a second car carrying flowers from friends and close family including a heart shaped blue and white wreath from BFITOY. We entered the church to 'Helpless', Albie's beautiful recording. The first hymn was 'All Things Bright and Beautiful ' . Lynne Amena and Colin Paul , both close friends of Albie gave the Family Tribute, telling of happy times with him and how much they loved and will miss him and his wonderful sense of humour. He always had time for people and enjoyed chatting and of course singing both as Jason Eddie and then with his tribute to his much loved and missed brother Billy. Colin said that Albie taught him a lot of stagecraft and after one appearance told him never to wear trousers with white pockets while sharing his stage ever again....just not professional! St Anne's is Jean's family church and her ex-vicar The Reverend Jonathan Anders came out of retirement to do a reading from Ecclesiastes and a prayer, showing the love and respect he has for her and Albie. A beautiful rendition of 'I Will' was then sung and played on keyboards by Dave from 'Liverpool Express' who used to play with Albie, most memorably at Rivington Barn. This was followed by an address from The Venerable Bob Metcalf which was very moving. After The Lord's Prayer we sang 'The Old Rugged Cross' and there was the Commendation and Blessing. We all exited the church to a recording of 'In Thoughts Of You' from one of Albie's live shows. We then made our way to Springwood Crematorium, a beautiful place in a lovely area taking a detour past 'Wondrous Place', Jean's home which was once home to Albie too. 'Helpless' was played through loudspeakers and everyone stood in silence as the coffin was removed from the carriage once more for Albie's last journey. After a brief prayer we said our final tearful goodbyes and left to be met by Jean who was so brave and took the time to have a word with everyone even though she was very distressed. We were invited to Woolton Golf Club which we got very lost trying to find but eventually arrived to a marvellous buffet and we had a chance to catch up with everybody and reminisce about our dear friend who we will all miss so much. Again, Jean was chatting to everyone and most people got the opportunity for a quiet moment with her. She says she doesn’t know what she’ll do after losing another beloved son but we pray she’ll come through in the knowledge that so many people love her and will be there for her. Donations to 'Mersey Kidney Research' or 'The British Heart Foundation' can be made c/o Pearson Collinson Funeral Directors, 87-91 Allerton Road, Liverpool, L18 2DD and will be given in Albie's memory.